Sometimes, rewards can give you the encouragement and motivation you need to complete healthy programs and activities. With My Health Rewards, you can create your personalized path to health and earn rewards for participating in healthy activities. 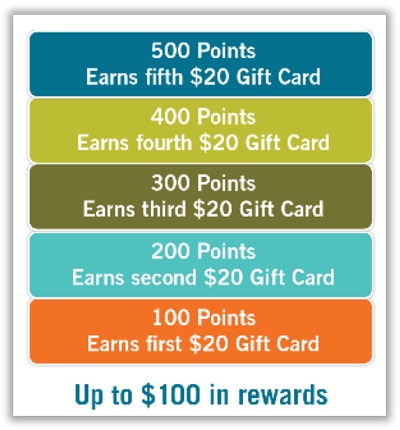 For every 100 points earned, you’ll receive a $20 gift card from Medica, up to $100 per year. 25 points for about Monj and 75 points for completing nine Omada lessons. Check your rewards progress on the REWARDS page. Each time you earn 100 points, you’ll receive an email with instructions on how to collect your reward. ➡ Watch for an email from Hallmark within seven business days of reaching your point goal. Make sure your email address and phone number are correct so your gift cards can be easily delivered to you. If you need to update your email address and phone number, click PROFILE in the upper right corner of the site. Then select CONTACT and update your information. Click here for a list of all the available retailer gift cards. ➡ Watch for an email from our reward partner, Hallmark Business Connections (HallmarkBusiness@HallmarkBusiness.com). Occasionally, the mail may be sent to a spam file with some security settings, so double check if you don’t see the message in your inbox. To view and redeem your reward, simply click and redeem. There are many options to choose from and you can even sort by category. Some merchants offer both mail and email options when selecting your gift card. Enter your contact delivery information and you’ll receive you gift card via mail within seven business days or within 24 hours if you select the e-card option. It’s that simple.